There's nothing a Luxembourger likes more than telling jokes about our Belgian neighbours. Imagine how disappointed I was when I first listened to the already fifth album by Belgian thrash veterans After All. There is (nearly) nothing funny about The Vermin Breed, an old school grenade that makes you forget the last fifteen years in thrash metal. I even feel ashamed that I never heard of this band from the picturesque city of Bruges before, as each and every song on their new album is overwhelming. There are some facts that should get you salivating: 1. After All played already with Eighties legends like Voivod, Anthrax, Overkill, Destruction,... (just to name a few), 2. The new album is released on a new label founded by ex-Noise Records people and a guy from German retro metal band Iron Savior. 3. They chose to let their new record be produced by Eighties icon Harris Johns. That's a lot of name dropping for one album, but does this eventually help? Definitely yes, because even before I was informed about the band's history, I was convinced by the amazing quality of the song material. The songs are mostly fast, technically precise, brutal with great dual guitar interplay, the rhythm section is bone-dry, the way I liked it in the early Nineties (anybody remember bands like Atrophy and I.N.C.?). Of course there is hardly originality on the CD, and certainly no innovation. But compared to most bands who only clone what's fashionable, you have with After All a band with a history dating back more than ten years, mature musicians who probably studied the thrash classics of the past (Deny The Dream has the same opening riff like a song by Nuclear Assault), and made the very wise choice to have an unbeatable producer. If The Vermin Breed had been released in the high time of old school thrash, it would probably have drowned in a flood of equally good albums (and yes, nowadays you just get better production), but as things are today, this Belgian whirlwind has enough power to blast away all nu metal bands combined together. This is thrash metal the way I loved it when I was an adolescent. Therefore anything less than 10 points would be a disgrace. 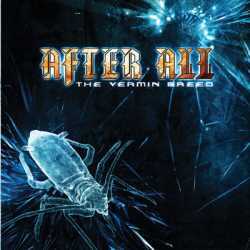 After All are the best Belgian band since the underrated Channel Zero (and I doubt that CZ were ever that good). About the (nearly) no sense of humour: the CD comes with a hidden bonus track. It's a cover version of the metal parody that was sung by this strange Russian in the Clerks movie. I wonder how many people recognised that one. You have to be a mad Belgian to cover a song from the best Kevin Smith movie ever. The album is also available on limited blue vinyl with a different (and much better) cover artwork.